The Teacher with "eyes at the back of her head!" 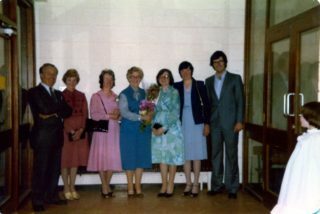 Photo taken at Miss Greene's retirement in 1981. L-R Principal Mr Oliver Burke, Mrs Higgins , Mrs O'Halloran, Miss Greene, Mrs Gannon, Miss Curran, Mr O'Toole. 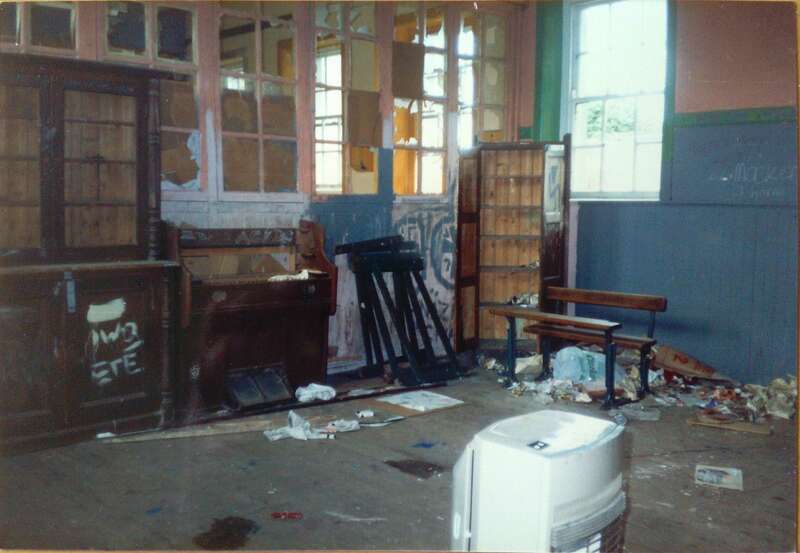 Miss Greene's classroom in Áras Uilinn at a time when the building had fallen into vacant disrepair. Before it goes too far past the festive season….. a childhood Christmas memory for me was coming to the end of term at Scoil Mhuire (Áras Uilinn building – at the time housing two classrooms) and our teacher Miss Nell Greene would gather us around a large cardboard box placed upon her big old chunky wooden desk so we couldn’t see in, and to true Mary Poppins style managed to produce something for each of us from its seemingly endless bottom! The anticipation and excitement over what surprise you were going to get… tokens varied from pencils to notebooks and knitting sets to soaps. In truth it was probably an odds and ends Winter clear out, but whatever we got, there was always appreciation for her kindness. It may only have been the early 1970s, (not so long ago! ), but she would place a rug on the dusty wooden floor, in front of the solid fuel stove in her classroom, where we could sit and play board games as a treat. 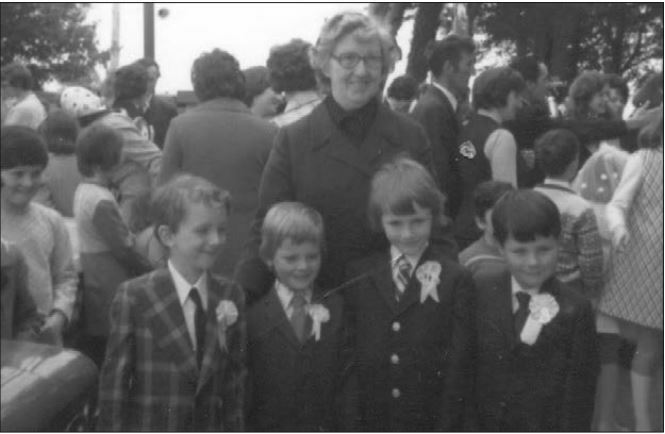 I often think of Miss Greene and how much an integral part of Moycullen she became, having taught more than one generation of many families in our locality. 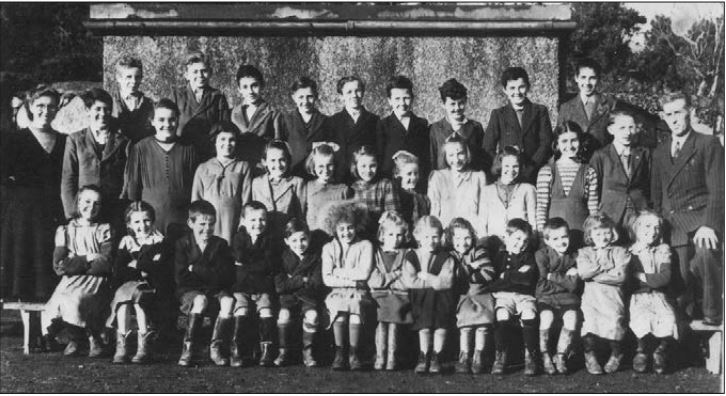 Originally from Carna, her first school in our parish in 1949 was Loughwell and then Scoil Mhuire in 1971 until her retirement in 1981. During her time here she lodged in what is known as Kynes or May Savage’s House (the dwelling on mountain road at rear entrance to Regan’s Bar) and then for many years lodged at Mulkerrins opposite Gairdin Maire. She lived out her final years at her brother’s home in Fairhill, The Claddagh, before passing away at Galway Hospice on 30th April 2000. ……. without any of us ever catching a glimpse of those “eyes in the back of her head” she kept telling us she had! Miss Greene taught me in Scoil Leamhchoill. She was a nice lady but a bit over the top on religion. She lectured us each Easter about the cruxification and made us feel that it was all our fault. I loved Miss Greene. She always gave me a hard time about painting my nails. She had a very positive influence on me. Miss Greene was a legend!! I loved her in Loughwell school and being brought to a play in the Taibhdhearc as a special treat with Karen is a favourite memory. RIP.